The reason for the fact that there is no update since weeks is the restructure of the gui. I didin't like the many moveable views any more. So there is the time for a new ui where you can act into one window. It is more useable than many windows. To set the position of the menus was no problem. In futur you will find them on the left side. The MenuBar on top of the old design will stay. 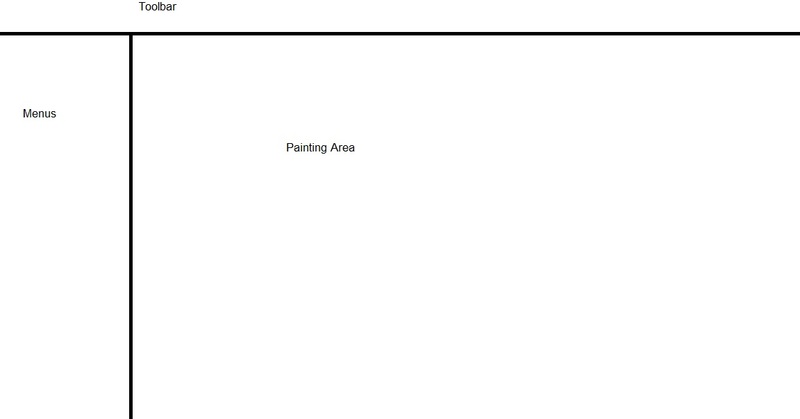 The different PaintingAreas will fix their position next to the menus, like you can see in pic 1. But there is (or actually was) a propblem. To work with 3D graphics you need a perspective camera on your scene. When I separeted the PaintingArea it was no problem because I used a single stage with a scene for every Painting Area. Now I want to integrate the PaintingArea and can not use a scene. Of cause, I can set up a perspective camera to the main scene. But if I do this, every 3D graphic object could lay over any menu. That doesn't look cute and is not useable.